Indulge your patrons with the rich, creamy flavor of dark chocolate blended into their coffees and specialty drinks with this Torani 16.5 oz. dark chocolate flavoring sauce! It is packaged in a user-friendly 16.5 oz. plastic squeeze bottle, making the sauce easy to dispense. Featuring a thicker consistency than liquid flavoring syrup, this flavoring sauce is great for swirling atop whipped cream or blending into sweet frappes. It adds just the right amount of decadent dark chocolate flavor to any cup of freshly-brewed coffee. You can even use it to top ice cream, cheesecakes, and other homemade desserts. This Torani sauce will be the perfect, finishing touch to any beverage or dish, and is sure to keep your guests coming back for more! Much like anything else that Torani makes, this Chocolate is of great quality and it tastes like a million dollar chocolate. The price is overly fair. Nice dark chocolate sauce! Good flavor, good size, nice dispensing lid. Works great for flavoring drinks, or as a topping for ice cream, etc. Added bonus is that refrigeration is not required. Again Torani can't be beat! The possibilities for this sauce are endless! We drizzle it over cake, decorate a plate with it, use nit on pancakes, to top drinks, freeze it on spoons full of peanut butter for a cold peanut butter cup type treat. I could go on for days, it's just so versatile. Torani dark chocolate sauce is delicious and has the perfect consistency. We use it every day in our shop; mostly for lining the inside of our milkshake cups, drizzling it over sundaes & drinks with whipped cream, and topping cupcakes with it. I especially love that refrigeration is not required. We also love their caramel sauce too. These are a convenient size for at home use and have a user friendly squeeze nozzle. Same great quality as the larger option with pump but makes a great gift. Dark chocolate flavoring sauces are really popular in all of our dessert shops. I now have this product set to auto reorder because it is that good. A nice and easy to handle bottle of dark chocolate flavoring sauce. It is perfect for drizzling over fresh strawberries for a quick and great tasting dessert. The dark chocolate is a great garnish for cooffees and dessert. You can not beat the price point either. We are glad we added this product to our inventory. This was fantastic for brunch. Great drizzled over waffles, in coffee, and over pancakes. Everyone loved it. Fantastic shipping. It came wrapped in plastic and stayed sealed through shipping. I love that this chcolate sauce comes with a spout designed for drizzling. It makes for an appealing presentation and the taste is great too. Our breakfast customers love this incredibly rich dark chocolate sauce. They add it to their coffee, they drizzled it over pancakes, and biscuits, and waffles ......... a very reasonable and affordable price too. I love the flavor of this dark chocolate sauce it is perfect in my morning coffee. It would also be great for any type of dessert especially at cheesecake or ice cream. YUM! This is restaurant, cafe quality that will wow any mocha lovers palate. The rich taste is delightful, and only a small amount delivers the rich chocolate decadence you're looking for. I love Torani sauces for all of my specialty coffee creations! It tastes great and looks nice drizzled on top of a hot latte or around the cup of and iced coffee! This Torani dark chocolate flavoring sauce has a deep chocolate flavor that is delicious on ice cream, waffles, fruit or to top a drink or a piece of pie. Webstaurant has the best prices and fast shipping. The Torani Dark Chocolate Flavoring sauce is the perfect way to top off a Cappuccino. I have also used it as a flavoring in my espresso. Pour your hot espresso in your cup, put a squirt of Torani Dark Flavoring Sauce, stir it around, add your milk frothing, whipped cream and drizzle the Torani Dark Chocolate Flavoring sauce on top. We love this product and use it daily, We are very satisfied with this purchase! We use this amazing product because it taste and looks jaw dropping. A great sauce that is perfect for drizzling a garnish on top of a coffee or making a quick sundae. The no mess squeeze is ideal. This dark chocolate sauce is great in coffee to make a flavored drink, drizzled on a plate with fruit or as an addition to your favorite dessert, ice cream or brownie. And on cheese cake too! Small amount of dark chocolate sauce as a back up i case we quickly run out of our larger bottle. Stores away easy and is the same goood product. This is a thick chocolate syrup and tastes great. We use this as a swirl inside glasses for our hot chocolate and over the whipped cream. Really ups the presentation value. This is a rich, thick, dark chocolate sauce that does not disappoint! A must have for ice cream, coffee or anything else you love chocolate on. The price is great too. Love The Torani dark chocolate flavoring sauce. Just a splash in your coffee or on your favorite desert changes everything. Will continue to buy more Torani products. Great flavor on this Dark Chocolate Sauce. This is perfect in coffee, on ice cream, in pretty much any dessert or simply dipping for strawberries! This sauce can make tasty treats even better tasting. Dark chocolate just has a richer flavor, to me anyway. The consistency is also very good. This chocolate sauce tastes great and is perfect for my banana split cupcakes. I drizzle it over the tops and it looks fantastic and quick enough to stay put. Rich and dense. It has a great designed squeeze tube (flip top cap) and doesn't need refrigeration once opened. You don't need much to taste the flavor, a little goes a long way. It is great for beverages and ice cream. We use this Torani dark chocolate in our home because we saw it in a cool yogurt store. We love using it for ice cream, chocolate milk, or mocha coffee! This sauce is amazing!! I used it for an iced coffee, on top of the whip cream and it was delicious, will buy more flavors, thanks Webstaurant! Will try also in cupcakes and ice cream, delicious! This Torani dark chocolate sauce is tasty and the quality is impressive. It works perfectly for drizzling over ice cream sundaes or for flavoring a mocha latte. You can't go wrong with a Torani product. This dark chocolate works great for making specialty drinks and also as a drizzle on your whipped topping. If you love dark chocolate, you will love this!! I use this in my chocolate milkshakes, it makes them taste amazing! Also, great in coffee and making hot cocoa a little richer! Authentic, Natural flavoring sauce that truly has quality behind its name. The sauce is easy to pour at first open and tastes far superior over other leading brands. Amazing sauce. Perfect dark chocolate flavor with a great deal of depth. Very thick. Make sure you don't use too much though; it is much stronger than the syrups. I love this sauce! I only use this in my lattes to make mocha lattes. It has a deep, rich taste that's not too sweet. It's subtle as I like to actually taste the coffee rather than just drink ''sweet''. Would be phenomenal on ice cream I'm sure! This sauce tastes really good and flows smoothly. The top makes it easy to make fancy designs--we drizzle it on top of whipped cream on lattes. We use this sauce for milkshakes and ice-cream sundaes. A little goes a long way. My husband no longer like herseys or any of the other chocolate sauces that can be store bought. great quality good price recommend that product. This product is amazing , the flavor is just unique one of the best sauce we have ever use , costumes love it ! ! Quality and great taste! I add this to my cake batters and to make frosting and drizzles wherever i need to add a delicious chocolate flavor! This flavoring sauce is perfect for topping hot drinks. I use it on top of mochas (on whipped cream) and it adds detail and a little something sweet. People love it. 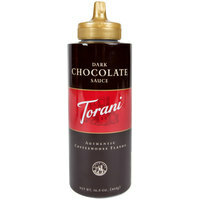 The dark chocolate Torani sauce is very popular amongst our customers. We are always hearing rave reviews from our customers how much they love it. We use Torani sauces in our coffee bar. The dark chocolate sauce is the perfect flavor for mochas and hot chocolates. We use this little bottle to drizzle the tops of our gourmet coffees. The Torani Dark Chocolate sauce is so yummy! It has a rich flavor that our customers enjoy. It is great for coffee drinks, hot chocolate, or topping off desserts. Nice chocolatey flavor, not too sweet, and just right for great mochas with no waiting and no trying to dissolve annoying powder. Would definitely buy again. I have bought two of these flavor sand this chocolate one it perfection. I use it on pastries in iced code to give it a sweet taste. I highly recommend this flavor. Will buy more. Torani makes such fabulous flavors. I am really enjoying the dark chocolate drizzled on my favorite desserts. Of course, my grandchildren had to try some in their chocolate milk and loved it!